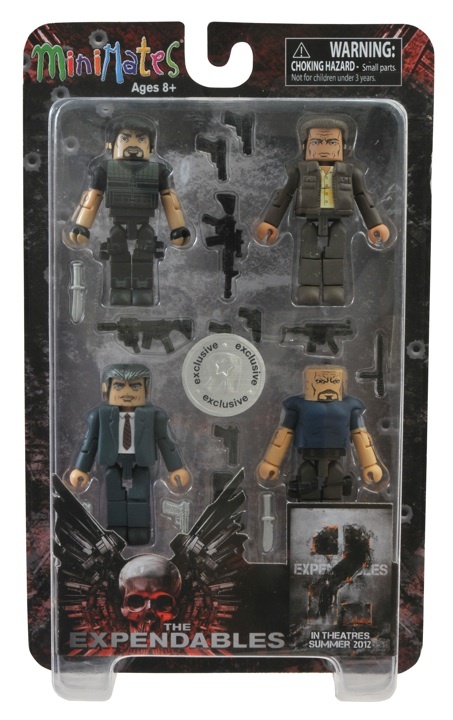 Art Asylum has posted some new in-package photos of their upcoming Expendables Minimates. By now, everyone has hopefully seen the new trailer for The Expendables 2. Even if you’re not a fan of the first one, the trailer is a blow-by blow tribute to the greatest action movies ever made and stars most of America’s greatest action heroes of the past 40 years. (Ladies, did we mention it’s also got that hunk from The Hunger Games?) 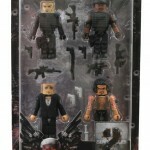 Well, before you go watch the trailer again, check out the packaging for the first two sets of Expendables Minimates! 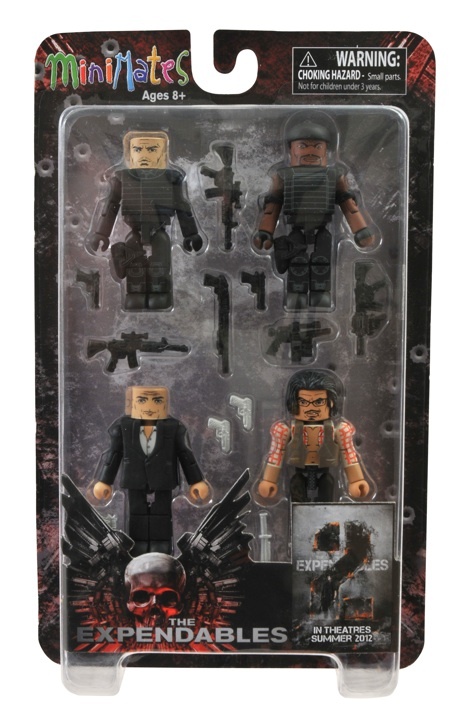 This summer will bring two four-packs of 2-inch minifigures, one exclusively at comic shops and specialty stores, the other exclusively at Toys “R” Us. Specialty will get Lee Christmas, Hale Caesar, Mr. Church and Tool, while TRU will get Barney Ross, Trent Mauser, James Munroe and Paine. 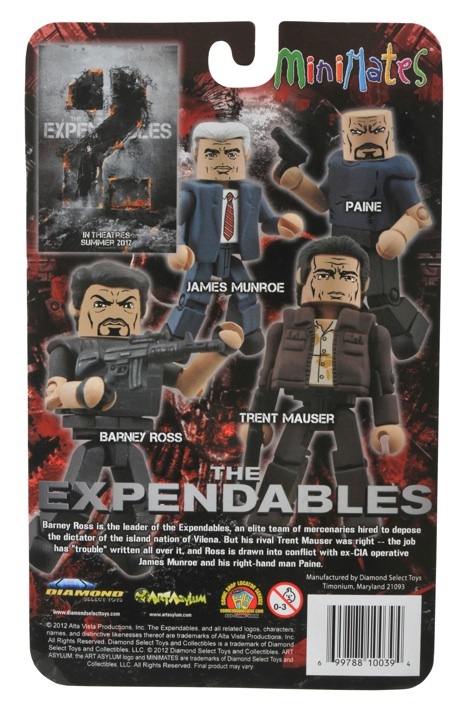 Don’t see your favorite Expendables team member? Well, there will be two more sets coming out this fall with the rest of the team, plus a few of the movie’s new villains! We’ll reveal those soon, but look for the first two sets in early June! 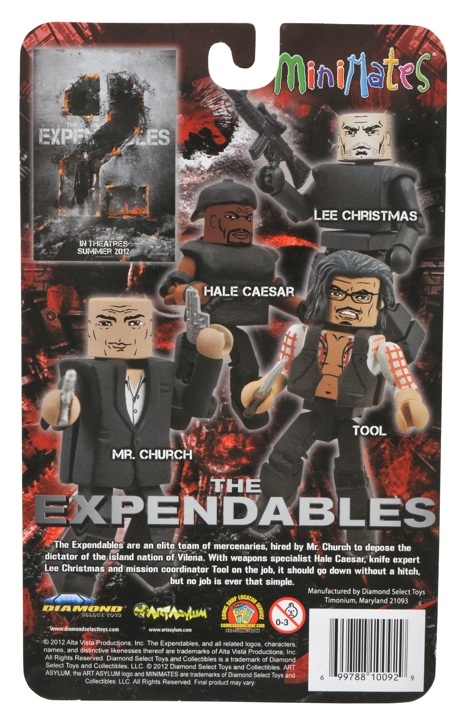 While I am not a fan of how Chuck Norris sanitized the script, I do like Minimates and the 1st Expendables, so I might pick these up. I think some one will be getting these for me, but if not. I'm still getting these!!! !